What’s the minimum number of people needed to organize a tour? Your tour needs at least 16 participants. This can include players, coaching staff, team administrators, parents, relatives/siblings, and anyone else who you would like to join the group. Discounts are available for groups larger than 30 participants. Who would my team compete against? We have youth, club, high school, College and professional volleyball teams in Costa Rica. When matching your team to Costa Rican opposition, we take into consideration your team’s age, competitive level, recent league and tournament performance, and other factors. What other volleyball teams have traveled with your company? We have hosted lots of boy’s and girls’ volleyball teams of every age and competitive level since 1995. The majority of our clients are college teams, high school teams, club teams, and amateur adult teams. Click to see what our clients have to say about us. Do I need any vaccinations to travel to Costa Rica? No special vaccinations are required for U.S. and Canadian citizens to enter Costa Rica. If you have special health concerns, we recommend that you check with a physician with knowledge of travel medicine. How old should players be to travel to Costa Rica? We have hosted players as young as nine years old. Costa Rica is a very family friendly destination and parents and younger siblings often join the tour. Do I need a passport and/or visa? U.S., Canadian, and many European citizens may enter Costa Rica with a valid passport and do not need a visa. If you are traveling from another country please check the Costa Rican embassy web site. Will my medical insurance cover me in Costa Rica? We require that every tour participant has adequate medical insurance that covers him/her during the tour. Contact your insurance company to find out whether it will cover you on international trips. If not, we can recommend some travel insurance companies that our clients have used in the past. Do you provide travel medical insurance? We do not offer travel medical insurance as part of our tour packages. You can request a custom proposal and tour pricing for your team by contacting Costa Rica Sports Tours. Cancellations processed 90 days prior to departure are fully refundable (does not apply for airfare). Cancellations processed 89-61 days prior to departure result in a loss of 50% of the total program fee. Cancellations made within 60 days of departure result in a loss of the total program fee. I’ve never taken a team tour before – how do I get started? Step 1: Request a volleyball tour proposal for your team online. Step 2: Review it and meet with one of our tour experts to customize it according to your needs. You can choose your team’s travel dates, tour length, number of games, number of trainings, and sightseeing activities. Step 3: Meet with your team and present the customized proposal. Determine the tour dates that would work best for the team. Once you have possible dates, we can request airfare pricing and you’ll have a better idea of the total cost per person. Step 4: Communicate the payment plan to your team and start preparing for the best international volleyball tour experience ever! Can parents go on the trip? Yes, we are happy to include parents and family members on the trip. They have joined our tours in the past and have been excellent additions to the group. The additional adults make helpful chaperones when there are lots of underage players. We can include them in any and all of the team activities. The tour price for parents and family members is the same as for players (children are less, see below). However, we understand that, depending upon the objective of the trip, the coach or team administrator may not feel that it is appropriate for families to travel with the team so we leave this decision up to whoever is organizing the volleyball tour. Can children go on the trip? Yes, they can. However, they do have to be accompanied by an adult. We have discounts for non-player children under 10 who are traveling with a parent. Please contact us for details. Do all room accommodations have to be triple/quad occupancy? Our standard prices are based on triple and quad occupancy. For an additional cost per person, we would be happy to arrange for you to have a single or double room. Can Costa Rica Sports Tours handle my air travel arrangements? Yes. We price airfare separately from our land portion tour package. If you prefer to book your own airfare, you are welcome to do so. We have extensive experience planning and booking group air travel and work with six different airlines that fly to Costa Rica. We can get you an airfare quote once you please provide us with your possible dates and departure airport. How long is the flight to Costa Rica? What areas of Costa Rica will my team visit? Our most popular tour is nine days and includes a chance to experience the capital city, the rainforest, the volcano area, and the beaches (see sample itinerary). We customize the tour according to your team’s preferences. 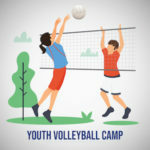 We can recommend more areas to visit depending on the length of your team’s volleyball tour and the number of games that you would like to play. Costa Rica is famous for its warm, temperate climate most of the year. 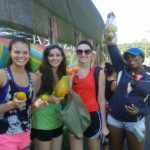 Costa Rican volleyball teams also play volleyball all year long making it possible to organize a tour during any dates that are good for your team. Spring Break and preseason are some of the most popular times to take a volleyball tour. What optional sightseeing activities are offered? How far in advance do we need to pay? We recommend that you begin talking to your team and planning your tour at least six months before you want to travel. We suggest making your team’s $100 per person refundable deposit as soon as you have determined your preferred travel dates. This deposit secures your team’s tour and guarantees that we will not have to turn your team away during our busiest seasons. 30 days after reservation: $100 deposit per person for land portion is due. 120 days prior to departure: 50% of remaining land portion is due. 60 days prior to departure: Final payment of remaining land portion, and optional sightseeing activity amounts are due. This is the last day for a participant to cancel the land portion without a penalty (payments would be refunded; does not apply for airfare). After this date and until 7 days prior to travel, you can replace a participant. How can I pay for my team tour? We manage our billing on a per team basis. This means that we invoice a single contact (most often the coach or a team leader) for the entire amount due. We ask that the contact collect the individual payments from the participants and use either of the following methods to send us the money. Bank wire transfer: you can request a wire transfer directly from your bank to our Bank of America account. We will provide you with this information at the payment time. Payments by check: you can submit payments by check if you deposit the checks directly at any branch of Bank of America in your area. Can I use a credit card to pay for my tour? In order to keep our prices low, we do not accept credit cards for payment. The 7-10% surcharge from the credit card companies would increase the cost of our tours to our clients. Does the group leader travel for free? We offer one free land portion for every 18 paying participants. This discount does not apply for airfare. What additional expenses should I expect to have? What is the approximate cost of air travel to Costa Rica? Airplane tickets to Costa Rica vary depending on your departure airport, travel dates and the number of people traveling. Round-trip airfare from the United States to Costa Rica often vary between $275-$600 per person. Is the water drinkable in Costa Rica? Yes, you can drink tap water at all locations where you will be traveling on your tour. How safe is Costa Rica? Costa Rica is a safe, stable, democratic country. Costa Rica abolished its army in 1949 and is known as one of the most peaceful nations in Latin America. San Jose is a major metropolitan city and we recommend that teams use the same common sense while staying there as they would in any large city. For example, we recommend using the buddy system and not walking around the city alone at night. Will I need to exchange money in Costa Rica? It is not usually necessary to go to a bank to exchange money once in Costa Rica. U.S. dollars and major credit cards are widely accepted (even in small town stores). The Costa Rican currency is called the Colon. When you buy something with U.S. dollars you will receive your change in Colones. We recommend NOT bringing traveler’s checks with you since they are not widely accepted in Costa Rica. Will I have access to Internet during my tour? Wireless internet access is available at nearly all of the hotels if you would like to use your phone, tablet or laptop. Once you start working on your team’s itinerary, we can confirm access at each hotel. Will my U.S. cell phone work in Costa Rica? Many U.S. cell phone will work in Costa Rica – but not all of them. Check with your cell phone company before you arrive to verify – and be prepared for possible extra charges. How can I get the team uniforms washed during the tour? Our tours include the cost for doing laundry for shirts, shorts, and socks used during all trainings and matches. Your full-time tour guide will collect the uniforms or clothes after each training and volleyball match and will be responsible for getting them back to you as soon as possible. We recommend bringing at least two sets of uniforms just in case the first one cannot be washed in time for your team’s next match. If you would like to wash personal laundry, you can use the hotel’s in-house laundry service. Some hotels have washing and drying machines available. Will we have a chance to buy Costa Rican souvenirs? Yes. There are many opportunities to buy great souvenirs everywhere in Costa Rica. Our tours include shopping opportunities in the itinerary. Some of the most popular Costa Rican souvenirs include: coffee, wooden handicrafts, leather goods, pottery, hammocks, and clothing.